Streets of Fire is a rare breed of film that features a unique yet familiar style and with some interesting casting choices, two of them brilliant with the young Diane Lane and Willem Dafoe. Note: Outside of the audio portion, this is a copy of my “Collector’s Edition” review. Plot Synopsis: Amid a brooding rock & roll landscape, the Bombers motorcycle gang, led by the vicious Raven Shaddock (WILLEM DAFOE), kidnap diva Ellen Aim (DIANE LANE). Her hope for rescue lies with unlikely heroes: ex-boyfriend and soldier of fortune Tom Cody (MICHAEL PARE), former soldier and two-fisted beer-guzzling McCoy (AMY MADIGAN), both hired by Aim’s manager and current love, Billy Fish (RICK MORANIS). Quick Hit Review: Streets of Fire was a surprisingly enjoyable and gem of a film from the 1980s that was bust at the box office (taking in only $8.09M or $21.3M with ticket inflation) but has garnered a cult following in the 30 years since its release. What stands out isn’t really the performances, Michael Pare was serviceable enough, while Willem Dafoe delivers the goods as an out-there villain and Diane Lane was gorgeous as ever, but instead the aesthetics mixing 1950s production design, 1950s and 1980s costumes and amazing 1980s music which was fantastic (to the point I will pick up the soundtrack). 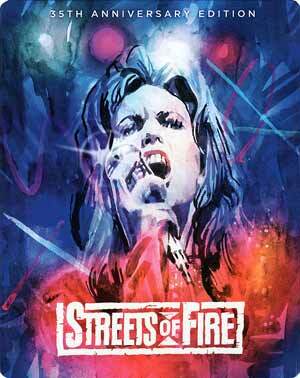 Co-scripted, with Larry Gross, and helmed by master director Walter Hill, Streets of Fire is a fun romp that, even with the somewhat cheesy 1980s music and lyrics, still works today. This is a Steelbook release that contains the same features from the “Collector’s Edition”. Shotguns & Six Strings: The Making of a Rock N Roll Fable (1:40:23; HD) is a feature-length documentary that includes new interviews with co-writer/director Walter Hill, actors Michael Paré, Deborah Van Valeknburgh & Richard Lawson and Screenwriter Larry Gross and others (producers, art director, editor, etc). This goes through the origins of the project as well as some behind-the-scenes stories and its cult classic status over the years. Only downside was they couldn’t get Diane Lane or Willem Dafoe (no surprise Moranis is absent). 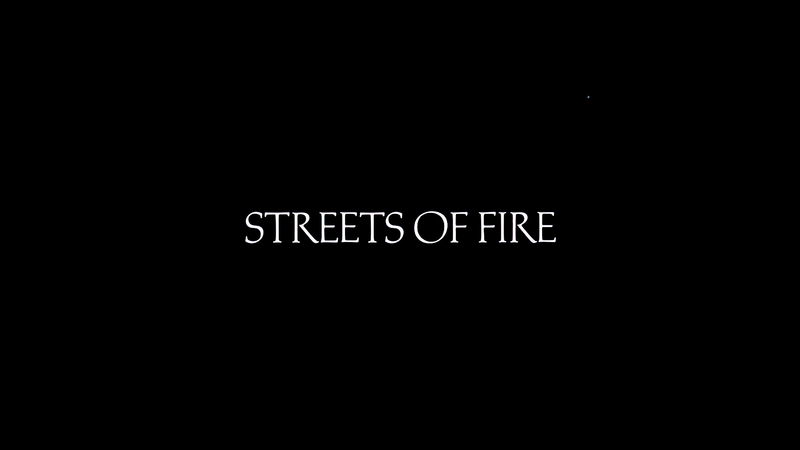 Rumble on the Lot: Walter Hill’s Streets of Fire Revisited (1:22:29; HD) is an older featurette (well, 2013 anyway) that is still quite lengthy and features some more interviews with the cast and crew. Also included are Vintage Featurettes (10:43; SD) from the early 80s; some Music Videos (8:39; SD), Theatrical Trailer (2:25; SD), On-Air Promos (13:12; SD) and a Still Gallery (10:22; HD). 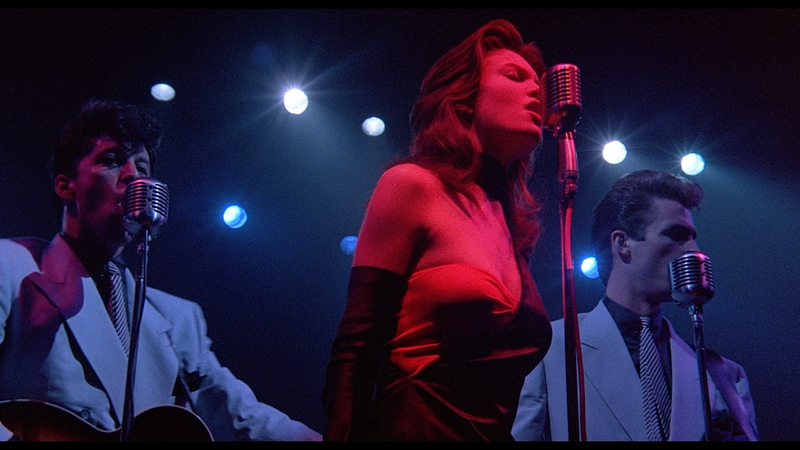 Streets of Fire takes the stage onto Blu-ray presented in its original theatrical 1.85 widescreen aspect ratio and a 1080p high-definition transfer using a new 2K scan from the film’s interpositive. While detail was rather sharp and colors appear to be natural in appearance, I did notice, at least early on, some instances of specs and in one frame, a major instance of film damage; not quite sure how that was missed. But after that, it’s an impressive, and clean, transfer. The movie comes with both a DTS-HD Master Audio 5.1 and 2.0 tracks, either option sounds fantastic (I watched the entire film using the 5.1 track). Dialogue levels were crisp and clear but where these lossless tracks come to life is with the soundtrack both on and off screen, coming through each channel with clarity and no obvious signs of pops or crackles. New to this “35th Anniversary Edition” Blu-ray release is a 4.1 channel track and… sounds perfectly fine, though the selling point for purists is it was created from the 70mm six-track magnetic audio source. Nothing astounding and honestly the 5.1 option is just as good, but still good quality audio. 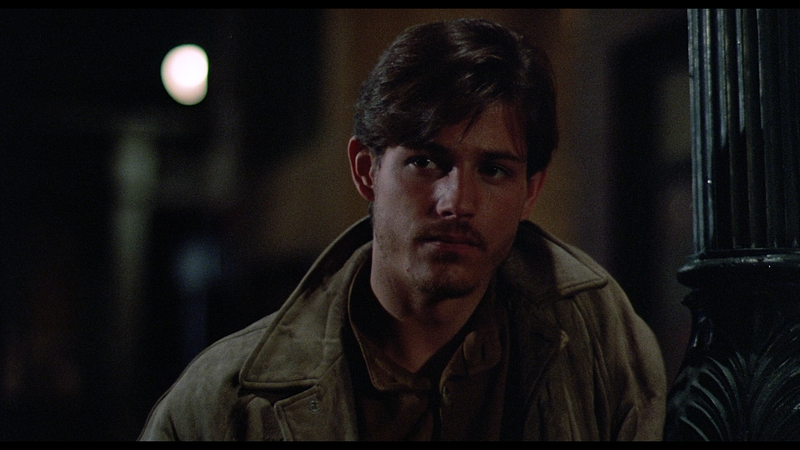 Overall, Streets of Fire is a rare breed of film that features a unique yet familiar style and with some interesting casting choices, two of them brilliant with the young Diane Lane and Willem Dafoe, if this one slipped by you, it’s well worth checking out. This new edition from Shout is pretty much the same as the Shout Select version, only coming with a new 4.1 DTS-HD MA soundtrack.